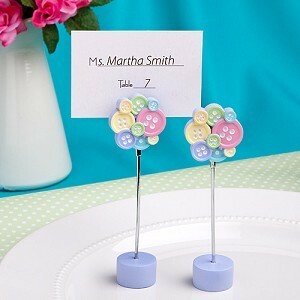 Get your baby favour choice right on the button with this Little Buttons Collection place card/photo holder. Your guests won't be able to keep their smiles buttoned up when they see these little treasures from Fashioncraft's exclusive Little Buttons Collection of baby favours. A pleasing pastel pallet and an adorable button design make this favour "sew right" for displaying event day place cards, a picture of your cute-as-a-button little one, memos and more. 	Tucked behind the charm is a silver metal alligator clip to securely hold a place card, photo, etc. 	A perfect fit for Baby Showers, Christenings, baby welcomings, baby birthdays and more 	These favours are sold individually and a blank place card is included for you to write names onto.